VESTMENTS. The ministerial dress of the clergy. At the beginning no peculiar dress was worn by the clergy of the Christian Church at the time that they officiated. But a special dress grew up spontaneously and almost necessarily. It was the practice of officials and of persons of condition in the time of the Empire to wear a more gala dress than usual at public ceremonies, and this example was followed by the Christian clergy. The special feature of the ordinarydress was the tunic; of the ceremonial dress, the toga or some other garment worn as a supervestment over the tunic. It was etiquette, for example, to wear the toga when dining with the Emperor, when it was beginning to be commonly given up. Fashions changed, but the old forms, having been once employed for religious ceremonies, continued to be retained in use for them. Thus, as time proceeded, what was in fact only an older fashion of lay dress, became peculiar to those engaged in religious rites or solemnities. The old forms of dress were clung to with the greater determination by the clergy when the Barbarians had burst into the Empire and spread through the provinces, because they served as a claim and proof that the wearers belonged to the civilised, not to the barbarian division of the world. 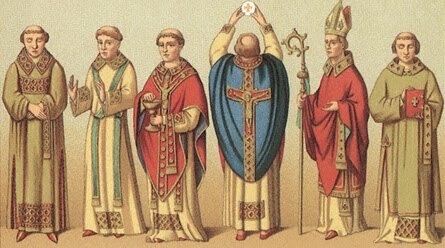 The old Roman secular dress continued in this way to be the distinctive apparel of the Christian clergy for some 800 years. Pope Celestine, in the fifth century, condemns “superstitious observances in dress” by priests with more than Puritanic rigour. At the commencement of the Middle Ages, in the ninth century, a change had come over the face of the world. The clergy no longer desired to distinguish themselves by outward marks from those who had formerly been despised as barbarians, but were now rulers of the Western world and represented by a Charlemagne. consequently the old Roman dress, now slightingly called Byzantine, was no longer a subject of pride to them. At the same time a wave of asstheticism and ceremonialism, emanating from the court of Charlemagne, passed over the Church, which led it to desire something more gorgeous and more symbolical than had hitherto been in use in the ministerial dress. Unaware that the existing dress of the clergy was no more than a slight modification of the old Roman toga, the Statesmen and Churchmen of Charlemagne s court (the two names represent the same persons) looked back to the Aaronic vestments as the origin of Christian clericalrobes, and they resolved to establish a likeness between them, which they could hardly discover in the existing forms. Speaking generally, the present Roman Catholic vestments were introduced at this time. Those who seek to restore them in the English Church are often unaware that they merely date from the ninth century, the beginning of the Middle Ages, and that the surplice, which they wish to supersede, is more like the robes worn by the Apostles and the first Christians than any other vestment. This may easily be seen by looking at early representations in the Catacombs and elsewhere. The Ritualist vestments belong to the Church of Charlemagne, not of Constantine. The first modification of the mediaeval garments in the English Church was made in 1549. The priest ministering the Holy Communion was then confined to the use of the alb, surmounted by a chasuble or cope ; the deacon or assistant priest to the alb with tunicle; the bishop to the rochet or surplice or alb with a chasuble or cope. In 1552 the alb, chasuble, and cope were forbidden, the priest and deacon being confined to the surplice and the bishop to the rochet.